The museum café is located in the main farmhouse (Storstugan). It offers coffee with homemade pastries, waffles and other tasty refreshments. 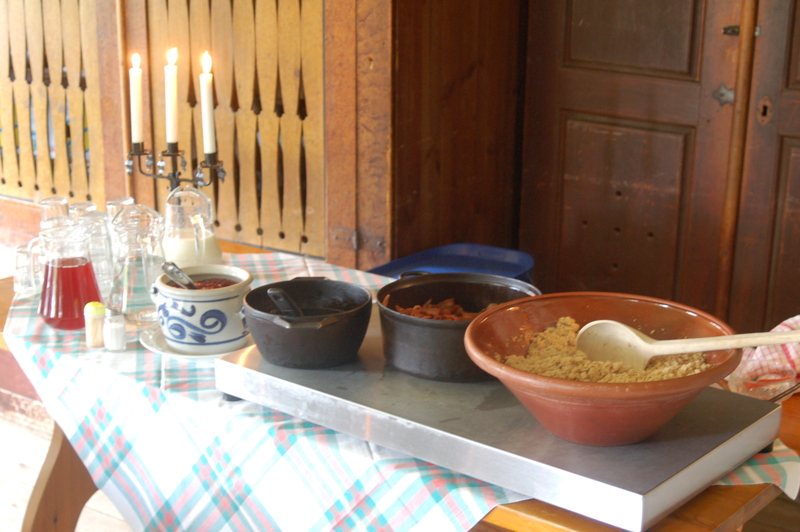 In the summer season, the traditional ‘motti och fläsk’ is on the menu as well. This is a local, Old Finnish meal consisting of roasted oatmeal porridge, bacon and lingonberry jam on the side. The café is open during events, and during the summer season daily from 12.00-17.00. Motti och fläsk can be ordered until 16.00. Motti och fläsk, including water, juice, coffee & cookie – SEK 110, or SEK 55 for children up to 12 years old. Coffee, tea with a waffle (served with jam and whipping cream) – SEK 55 – A second waffle SEK 35 extra. The museum offers catering to groups of max. 100 persons. The main farmhouse ‘Storstugan’ accommodates 60 persons and the storehouse ‘Torsbymagasinet’ 90. There is no heating installed at the Torsbymagasinet. More seating can be found outside. Group catering has to be ordered in advance, for more information, go to Rental.